The Simple Life of a Queen: Missoula or Bust! Hello Everyone! I hope all is going well with you all. It's been a slow and quiet week here. I'm just plugging away at my physical therapy appointments for my back. On Tuesday, he added back two exercises and I just got home from my appointment this morning. He's very happy with my progress but still no lifting more than 2 lbs. or vacuuming, etc. I can walk two laps around the mall and that's it. Still, it's better than I was doing before and the pain has given way to just being uncomfortable so that's progress! He's happy for me to sit and knit after I get my exercising done so the muscles can relax and mend. I really like going to my appointments because of the treatments they do to it. It feels so good on my back muscles. 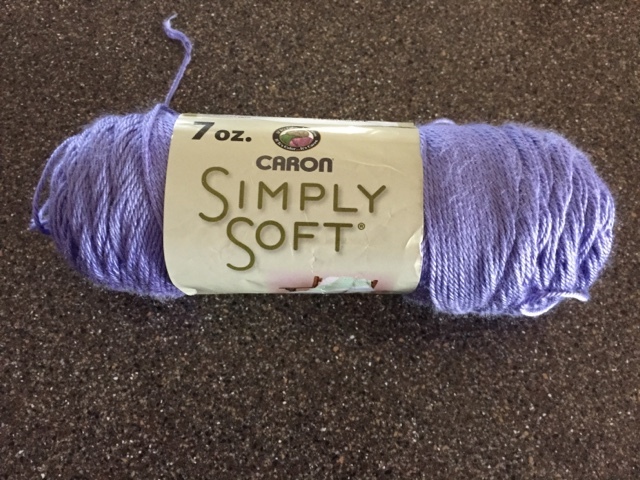 ...only in this lavender color. I forgot to take a picture and I've already taken it to the Crisis Nursery. It's a size 4/5 so will be good for a pre-school age child. They get donations for the babies, but not so much for the older children. I need to find a nice boys sweater pattern and make some of those. In other news, I snapped this photo the other day when I went to walk at the mall. 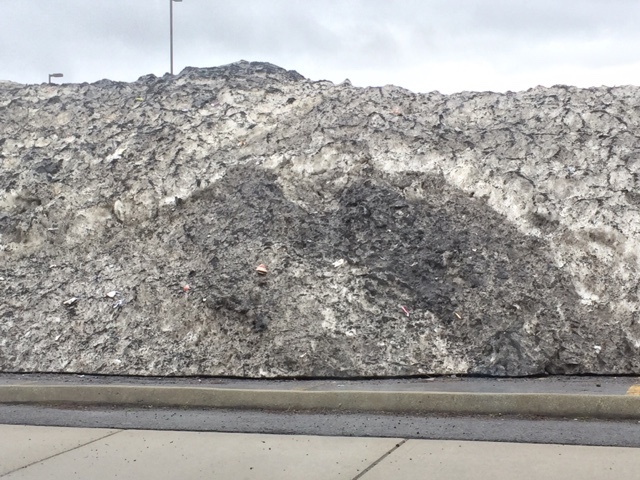 This is how high the snow piles, dirty as they may be, are around town. As high as the two story mall. Here's a cleaner side. Look, almost as high as the street lights. It was still there this morning when I drove by. Winter, go away. 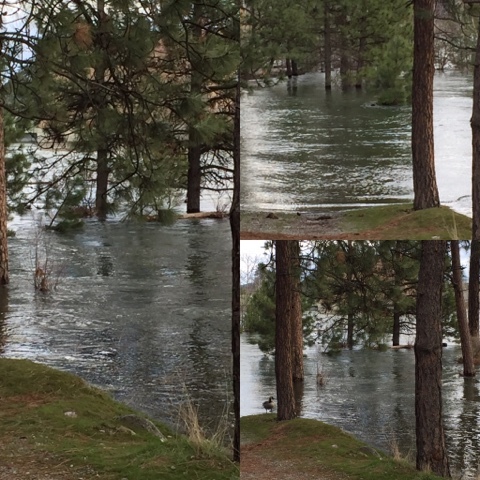 Obviously, some snow is melting because we've been in a flood warning for several weeks now. This is the river fairly close to us. Our first house here in Spokane is just about 1/2 a block from where I took these pictures. Do you see the ducks in the bottom picture? So much water. 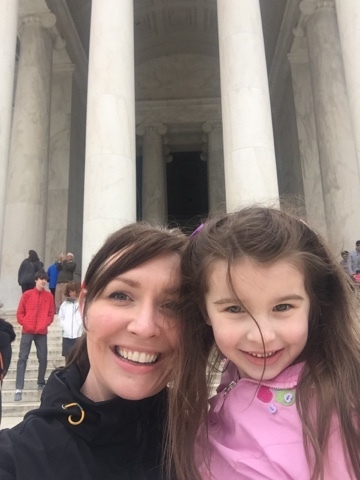 Mandy, Brad and Piper went into D.C. last weekend to look at the Cherry Blossoms. I love this photo. 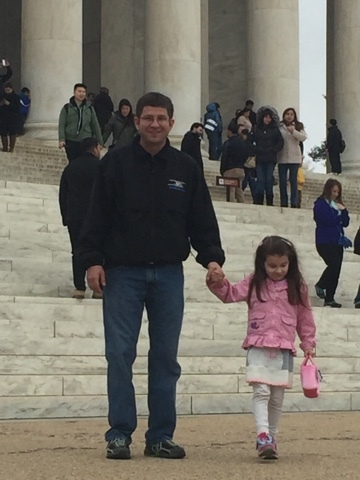 I think it was at the Jefferson Memorial but I could be wrong. Piper just loves her Daddy. My girls. Oh my heart breaks from not getting to see them in person for so long. Maybe soon though as they're in the process of getting ready to move once again. Still not here in Spokane, but a bit closer. And I started this yesterday. Hopefully it will become this when it's done. And guess what? It's for me! 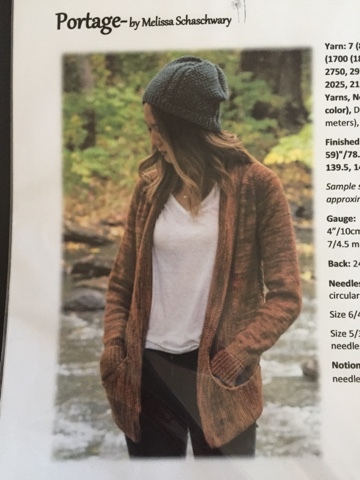 I don't make things for myself very often, but I've been wanting a cardigan for the lake that has pockets for my phone and a Kleenex or two when I take walks. The pattern is a bit confusing but maybe I'll be able to figure it out. Are you wondering about my post title? Missoula or Bust! We're driving to Missoula tomorrow to see Jamie, Kyleigh and Caleb. We've reserved a hotel room and are eagerly awaiting our trip to see our babies. We'll be home on Sunday and have a good friend staying here at the house with Chloe. I sure wish all of the kids were here, but I'll take what I can get. I haven't gone anywhere for so long, I've forgotten how to pack a suitcase. Believe me, if I could I would be packing one to go to D.C. I miss my girls and really need a Piper hug. There is absolutely nothing else remarkable happening here. It's been raining, raining, raining here so I spend a lot of time inside. No flowers are coming up. Nothing. It's spring on the calendar, but still resembles winter outside. I know it's coming though and I'm trying to be patient. Have a lovely week my friends. I'm going to go hug three of my babies, (even though one is a grown man, he's still one of my babies!) Am I right, all of you Mom's out there? It doesn't matter how old they get, they're still our babies and we love them. I haven't seen the cherry blossoms in years even though they are just down the road. Shame on me. 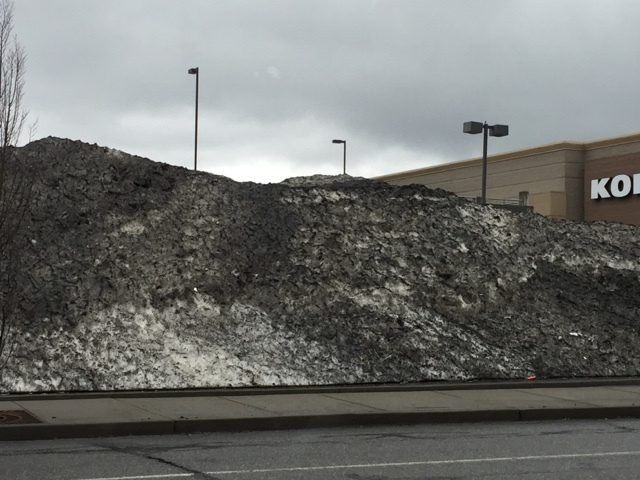 Your snow piles are just amazing. It's been a long time since I've even seen a pile half that size. Oh goodness that's gotta be hard to now be near flood stage with all that snow melting. 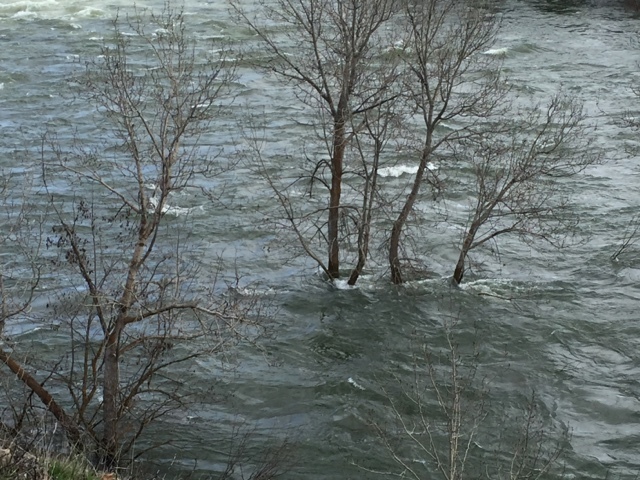 The rivers here are slowly going down. A co-worker is going on the Willamette tomorrow, maybe fish but doubt he'll get anything. A couple of my potted tulips are opening up today and a few more to come. 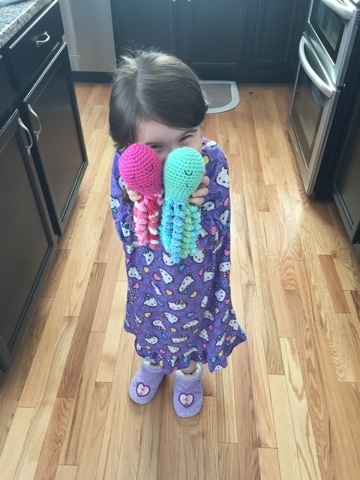 Happy to see Piper enjoying her octopi that you made. Have a safe and happy trip Missoula and enjoy your family time. I actually call my adult children my kids. I hope to see my grandchildren this weekend but not sure as they may have colds. Glad your back is feeling better. Hugs and blessings my friend. You are so right! They are always our babies. Several years ago visiting my mom's neighbor who was 93 years old, she kept telling us stories about "her kids" -- and my mom said to me, you know, when she talks about "her kids", they are all in their 60s and 70s. Ha! It seriously didn't dawn on me, but they are certainly always our kids. Gorgeous little sweater. The crisis center must be so thankful for all your donations. Glad to see you are making something for yourself. I'm sure you'll figure it out. 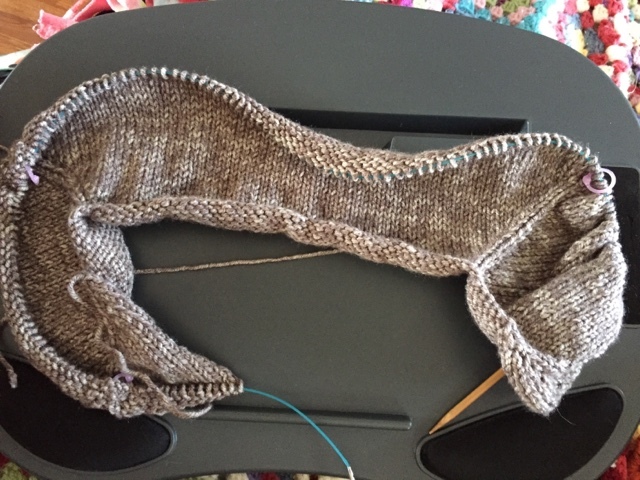 I'm working on a cocoon shrug for myself but have yet to finish it and now I've got to find the pattern again. I really should write these things down. Glad to hear you are seeing improvement with your back. I wrenched mine the other day so am "uncomfortable" as you say. It's always the lower back side that suffers because of my scoliosis. My NY boy sure is wanting real Spring to arrive. Happy Friday! Dear Betsy! You bless so many with your dear, kind deeds. You are such a precious worker for Jesus...such a shining example of His love. Those dear children will never forget your kindness. Little Piper just gets cuter all the time, and, my, she is growing. I can only imagine how much your heart aches to see them. May God let it be so for you. I can't get over the height of that snow pile! And, your sweater is so pretty...good for you to finally make something for YOU. Enjoy your trip and time with your loved ones, and YES, absolutely, they ARE always our babies...no matter how tall or old they get. We remember those first moments holding them in our arms, and that is just the way it will always be! Sending you much love and many wishes for a lovely time away! I am SO thrilled about your progress and I apologize for commenting on your 'sitting' so much as I had no idea you had broken something....dear me...I am SO sorry! I was just worried that all the sitting was going to make it worse....that's what I get for thinking by myself! LOL! Shame on me...I didn't realize that was what you were supposed to be doing! Goodness....don't ever listen to me! LOL! I could get you in a lot of trouble and worse pain! So glad you are healing and how exciting to 'get out of town' for a bit....it's good for everyone once in awhile. Piper and her Dad look so cute but I really love the picture of her in her purple jammies with the 2 octopi.....darling photo. She and her Mom make a lovely photo too. 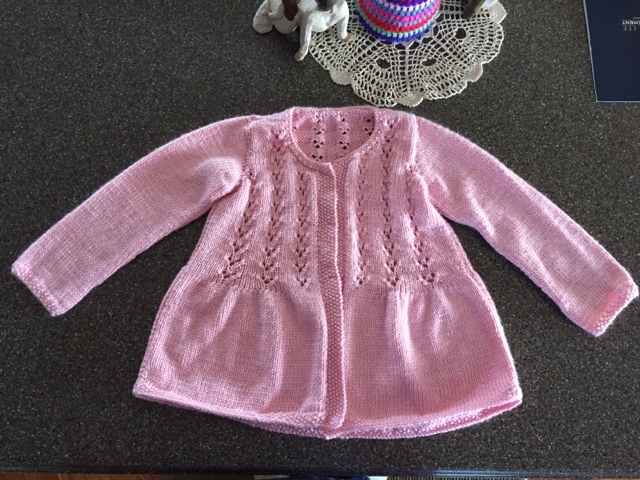 The baby sweater is beautiful! You are so talented! Stay safe from the flooding! I love the sweater you are making. Enjoy your weekend and your trip! And praying too the Lord in His mercy might send you a Piper hug even sooner than you think..meanwhile hug close those you can see and be content our Lord knows best. His ways are hard often, but are the very best. Would send you some sunshine but we've not had a lot either lovely knitting and think your cardigan is going to be lovely. Wonderful idea. Thanks for sharing your highs and lows dear sister, the rough and the smooth the Lord is with us.. praise Him!!! 😊 Good news medically too, that is great. WHEEEEEE family time! im with you 100%. Enjoy every second. Hey if you have time go over to kim at handeyecraftstwo.blogspot.com blog to enter for her anniversary contest. She gives great prizes. Not enough people enter her fun contests. Knit after exercise - good advice. I'm on a similar program this morning after watering the garden; time to sit, read blogs and get the crochet hook out with my feet up until it is time for the next exercise session - hydrotherapy for me today and I am looking forward to getting into the water. By the way, stay right away from the vacuum cleaner! Vacuuming is very bad because of the different ways it strains the body. Vulnerable bodies can get injured easily, plus vacuuming is a huge energy drainer, up there with making beds. Take it easy so you don't undo all the good work from your physical therapy. Nice to know you have some relief and are feeling a bit better. Hi Betsy, it is so good to meet you, thanks for visiting my blog. It brought me here. I had no idea that the weather was that bad in Spokane. Ours was like that for the month of March but April brought with it prettier weather. Weight Watchers is a great program, we do the low carb because my husband is diabetic and cutting carbs really helps. I am your newest follower and hope that you will return and follow me back. I have made so many lovely friends through blogging, it's a great place to share ideas. Have a lovely day and here's to warm weather and sunshine. Hope you had a great trip, Betsy! We just got back from Chicago last night and a fun ten days with DD#1 and family. Gosh, it's amazing how different the weather is in your part of the state except for the rain part. Our ground is really too soggy to try and do any yard work. Oh well, more time to knit, right? Happy Easter!